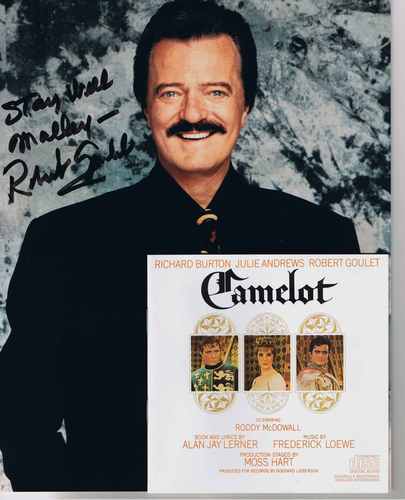 One of the great Broadway personalities, Las Vegas casino entertainers and television singing stars of the last 45 years, Robert Goulet became a major star on stage, records and television in the early 1960s. Raised in Massachusetts and Alberta, Canada, he was a star performer in his early twenties in Canada on the CBC network. In 1960 his big break came when he auditioned for the role of Lancelot in the new Lerner & Loewe musical romance Camelot. He starred in that production for two years and it gave him his lifelong theme song, "If Ever I Would Leave You." He starred in three Armstrong sponsored musicals adapted for ABC television productions of Brigadoon, Carousel and Kiss Me, Kate, from 1966-68. In 1968 he appeared on Broadway in the Kander/Ebb musical The Happy Time winning a Tony Award for his performance. During the 1960s/70s Robert was a headliner at many of the leading gaming casinos around the country and in major ampitheaters. During this time he was married to musical theater star Carol Lawrence and they often appeared together in Camelot; I Do, I Do; and Kiss Me, Kate and well as in concert. Later, under the management of wife Vera Novak, Robert was the star attraction in a number of touring musicals, notably South Pacific (1986-88); The Fantasticks (1990); Camelot (1992-94, as the King); Man of La Mancha (1996) and again in South Pacific (2000-2002). In the mid-1990s he returned to Broadway in the play Moon Over Buffalo, and again in 2005 as Georges in the revival of La Cage aux Folles, receiving good notices. He was a huge star in the 1960s on Columbia Records, releasing many Lp records. He was a consistent Lp seller, rather than a singles hit artist, although he enjoyed some success with "My Love, Forgive Me"; "Begin to Love"; "Fortissimo"; "Ciao Compare"--all with an English-Italian language romantico passione "feel" to them--and the engagingly fun "Summer Sounds." Robert later provided the theme songs for two films--Louis Malle's Atlantic City ("Atlantic City, My Old Friend") and Toy Story 2 ("You've Got a Friend in Me"). Complete and highlight Lps from famous musicals were prominent in his catalog--with Doris Day he did a best-selling 1962 studio version of Annie Get Your Gun and in 1963 he recorded the oft-neglected Manhattan Towers and The Man Who Loves Manhattan by Gordon Jenkins, updating the musical tribute to New York City for the 1960s. Two favorites of mine are the compilations On Broadway (1965) and On Broadway, Two (1966), now available on a single compact disc in terrific sound They have many show-stopper tunes of the 1940's/50's/60's--a great era for Broadway--Rodgers & Hammerstein; Lerner & Loewe; Frank Loesser; Cy Coleman; Kander & Ebb; Schmidt & Jones; Jerry Herman. Indeed, both volumes of the On Broadway Lps have several "cover" versions made famous by Robert--"On a Clear Day;" "The Impossible Dream;" "Who Can I Turn To;" and "Sunrise, Sunset." As mentioned before, the three television soundtracks from Brigadoon, Carousel and Kiss Me, Kate, are all superb, and easily available on Ebay and at private sales or used record shops. The Happy Time Lp was available on CD for awhile and can still be found. Camelot, of course, has never been out-of-print and his renditions of the two songs for Lancelot are the standard.Apparently his contract with Columbia Records was over by the early 1970's and he seldom recorded after that. A major complaint I have with that company, now Sony, is that Goulet should have been the Don Quixote on their studio version of Man of La Mancha in 1972, which starred Jim Nabors, Marilyn Horne, Jack Gilford and Richard Tucker. Nabors was their ballad singer by then, and thus the "star turn" for him. He's ok, but there's only one Robert Goulet! And Robert should have been asked back to record Emile de Becque in the mid-1980's Sony version of South Pacific, which starred opera singers Jose Carreras and Kiri Te Kanawa. Both are roles Robert made his own in several national tours. And, if we only had good DVDs of him in his stage peformances of The Fantasticks and Camelot in the 1990s. Ah, well... I'll stop there! The 1969 Lps Both Sides Now (the song "Those Were the Days" is worth the price alone) and Souvenir d'Italie (an Italian-English program) display the big stage-baritone voice of Robert, and are deserving of a 2-for-1 compact disc issue. Both are favorites of mine. His first Christmas Lp, This Christmas I Spend With You is worth hearing for laid-back renditions of several holiday pop tunes. Robert also gives his full "classical" sound to "O, Holy Night;" "Adeste fideles;" "Bach-Gounod "Ave Maria" and, my favorite, the Franck "Panis angelicus." In the 1980s/90s he became a popular actor in a number of movies including Beetlejuice, Scrooged, and The Naked Gun 2 1/2 and Robert was a television guest on every major variety and comedy show of the 1960s/70s/80s and into this century. He appeared many times on the Ed Sullivan Show in the 1960s, and Ed called him "the American baritone from Canada." It was common to tune into Merv, Mike or Johnny in those decades and see Robert. He did a series of popular 30-60 second basketball spots for the ESPN in the mid-1990s and an amusing, bizarre commercial for Emeraldnuts for the 2007 SuperBowl. Mr. Goulet became ill in September, 2007, and was hospitalized with pulmonary fibrosis, to which he succumbed on October 30th, 2007, a month before his 74th birthday. They just don't "make" charismatic, handsome matinee singing stars like Bob Goulet anymore. We saw him in South Pacific in September, 2002 in Omaha, and he was fabulous, opening up that big theater voice like he had thirty to forty years earlier. His performance of "This Nearly Was Mine" in Act II shook the rafters of the old Orpheum Theater. Thankfully a number of his 1960s albums are coming back on compact disc and as I stated before Ebay is a good source for almost all of the Lps. Many television clips from his television specials, guest appearances and commercials are available to view on You Tube, including not only the Emeraldnuts commercial (you have to see it!) but some 1960s/70s work with Julie Andrews, Andy Williams, Lucille Ball and others. Rest in Peace, Sir Lancelot. The contents and visual images on this page are the property of Keelan Music Archives/www.keelanmusic.com. copyright 2008.